In such a modern and busy place like Ho Chi Minh city, where can you have a peaceful place to sit down and release yourself from stress and all the daily issues? 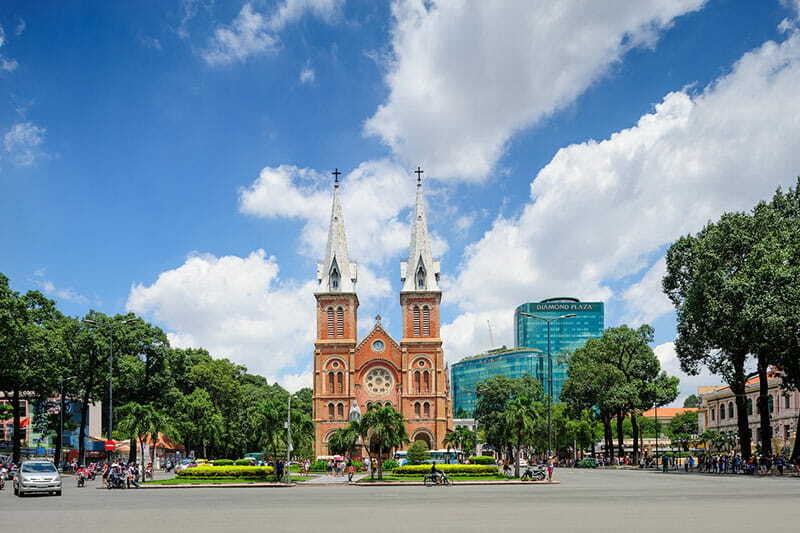 The Notre Dame Cathedral Saigon will be the answer that you wish could have known it sooner. Located in the downtown of Ho Chi Minh city (also known Saigon city) and being a part historical complex with Reunification Palace and Saigon Central Post Office nearby, attracts thousands of tourist and visitors daily, this makes Notre Dame Cathedral of Saigon become a convenient inclusion for any walking tour around Ho Chi Minh City’s major tourist spots. However, surprisingly, this amazing religious architecture still keeps within it the solemn yet tranquil atmosphere. 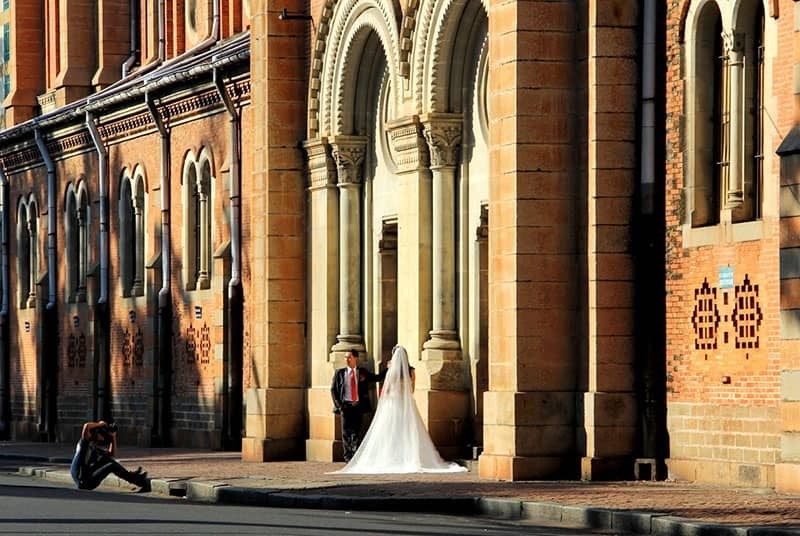 From the original design of the French architect J.Bourad, the first brick of the building was laid in 1877 and 3 years later, in 1880, the blessing and completion ceremony was held on Easter Sunday in April, officially announced the birth of this fascinating man-made construction. Later on, in 1895, two striking bell towers that soar to 58 meters was added. With the 3.5 meter cross on the top, it was the highest structures in downtown Saigon at the time. At first, the Notre Dame cathedral was called State Cathedral due to the source of the construction funds. 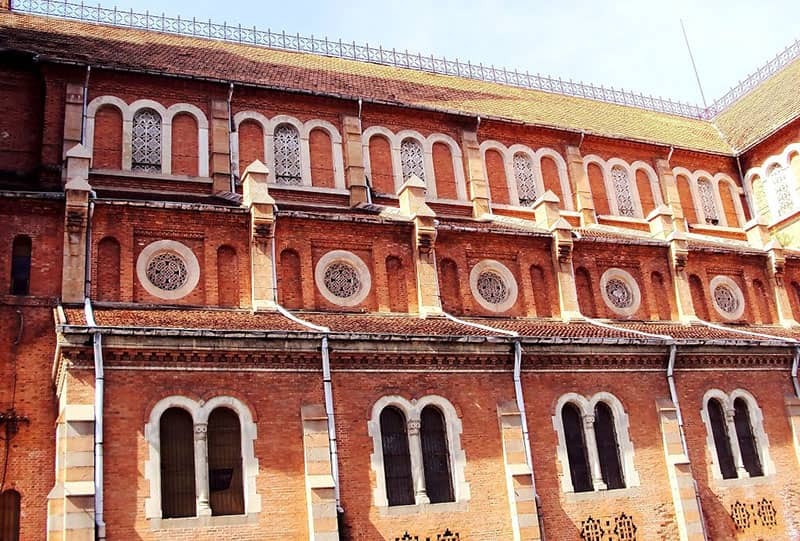 1962, Pope John XXIII anointed it Saigon Chief Cathedral and conferred the status of Basilica. Thus the official name is Saigon Notre-Dame Cathedral Basilica. Before coming inside the cathedral, don’t forget to serve yourself a “Saigon Cafe Sua Da” at the Sidewalk-Cafe or “Cafe Bet” as the way how the local called it. Sitting down with a coffee in your hand, you can observe the Cathedral wear on it the unique bright red brick, which originally imported from Marseilles that still retain their vibrant color today. Or a cute couple is taking pictures in the garden in front of the cathedral with the statue of Our Lady of Peace (Regina Pacis). 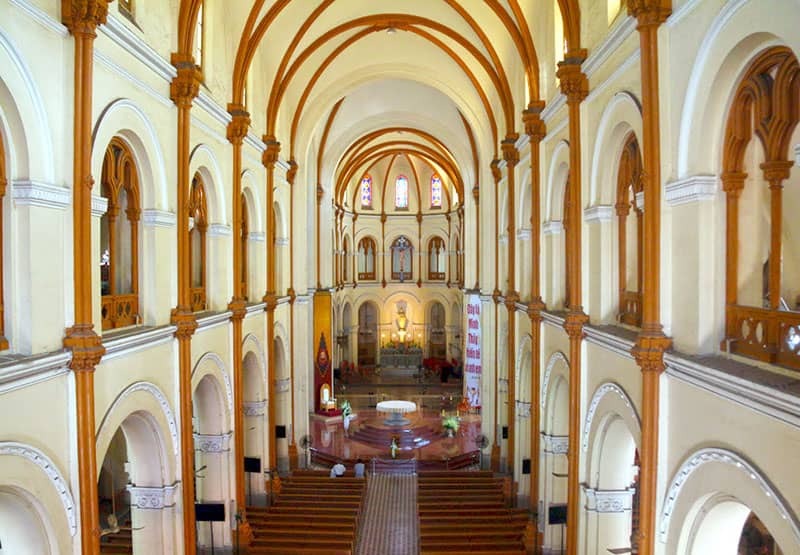 Crossing the street and pass by the rusty iron gate of Notre Dame cathedral Saigon, you will be in the main chapel, with the 21-meter high dome and capacity of 1200 people. Along with the main chapel, there 2 smaller side-chapel with antique statues and stone-altar. Back to the main chapel, 56 colored-glass windows create a magical light effect and the main marble altar that carved with Christian stories and characters, all together, they create a place where the echo of your soul can be heard and the anxiety is washed away. Leaving a refreshing mind to anyone has ever come and spent time here. 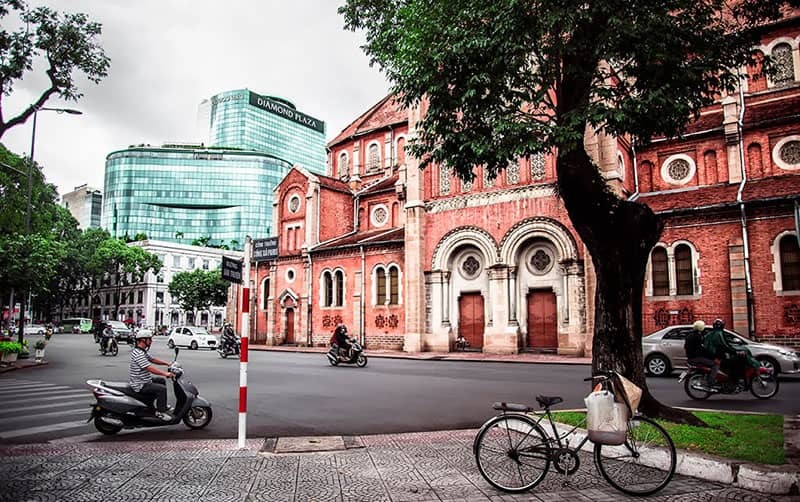 Stands against time and all the other struggles, the Notre Dame Cathedral Saigon is a perfect example of an architecture where harmonized between western and eastern style. Let’s explore this amazing spot, and you might discover a long-forgotten treasure inside you, who knows? 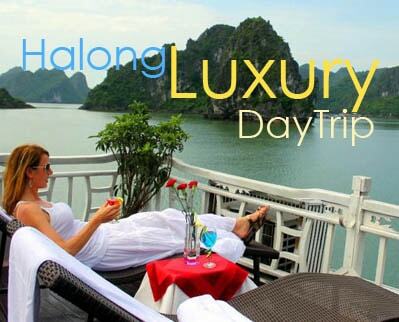 Join us on day trip Saigon to explore this highlight Notre Dame Cathedral.